This is the public profile of Jaroslav Kocourek, Additional information and high-resolution images are available for accredited press members, to access additional information about Jaroslav Kocourek please login as a press member. About Jaroslav Kocourek : Jaroslav Kocourek is a self-taught designer and illustrator (born 1991, Czech Republic). Since early childhood he has been passionate about art. As a 6 year old kid, he created impressive animal sculptures from clay. At the age of 14 he had for the first time access to a computer and discovered the world of computer graphics. 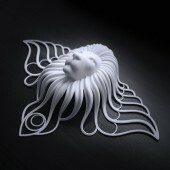 Ever since he developed his skills mostly as a 3d modeller and designer. After graduating from the Gymnasium, he attended few universities in the Czech Republic, but only for a very short time. He soon lost interest and found the education system limiting and extremely time consuming. He has begun to build his portfolio and focused on creativity, rather than on theoretical studies. After creating his first online portfolio in 2011, it didn't take long and a few companies offered him a job. Since 2014 he has been working as an officially self employed designer. With further advances in 3D printing industries, he started creating his own 3d printable art and now continues to experiment in this field. Adobe Photoshop, Advanced. Blender, Advanced. Zbrush, Advanced. Corel Draw, Advanced. Adobe After Effects, Advanced. Rhino, Intermediate. Press Members: Request an exclusive interview with Jaroslav Kocourek.